ADDIS ABABA, ETHIOPIA — Thousands of people have participated in the 9th annual Great Ethiopian Run that was held Sunday in Ethiopia's capital Addis Ababa. World marathon record holder Paula Radcliffe and Ethiopian long distance star Derartu Tulu launched the race as guests of honor. Today's overall winner was Tilahun Regassa, while Koreni Jelila won the women's race. Each received $2,100 award. The Great Ethiopian Run, which was started by Haile GebreSelassie in collaboration with Toyota Motor Company, is the biggest road race in Africa attracting tens of thousands of runners. Today's run was broadcast live for the first time by major international sport channels, according to event organizer Haile GebreSelassie. 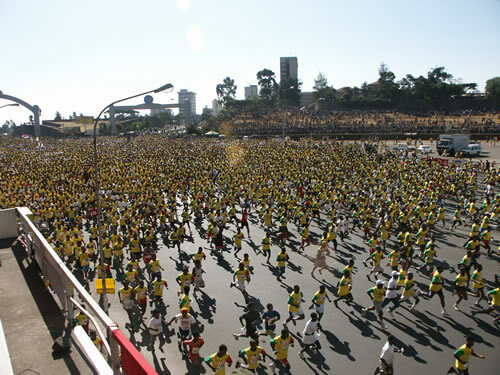 Since 2006, the Great Ethiopian Run has been used by Addis Ababa residents to voice their anger and frustration at the Woyanne regime, as they have no other outlet. Public meetings and opposition rallies are prohibited by the U.S.-backed brutal regime of Meles Zenawi. Today's event was a little different. The Woyanne regime was not the only target. The 76-year-old opposition party leader Hailu Shawel was the focus of protest. He was condemned by the runners for signing an agreement with Meles Zenawi on the upcoming general election without any tangible change on the part of the Woyanne regime, such as the release of political prisoners, including Birtukan Mideksa, leader of one of the main opposition parties.